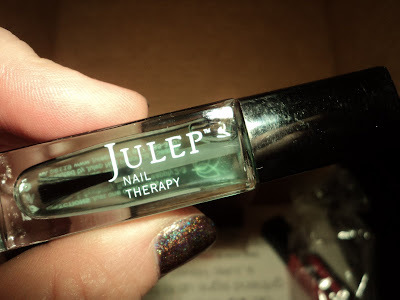 So late last week, I happened to "like" Julep's Facebook page and discovered that they had linked my recent review post of their products. At first, I thought it was so cool. Then... I realized that almost all of the comments were blasting me. :( They thought my application was sloppy, my pictures were bad, and generally, my post was crap. My immediate reaction was to get extremely upset and vow to cease blogging (I may have even teared up). I mean, no one likes being the center of negative attention. I honestly think that most non-bloggers don't realize how much work goes in to a post. 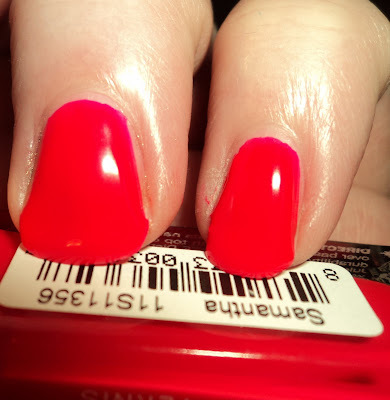 It seems that the entire nail blogging culture (and maybe the blogger-verse in general) is completely different that it was when I first started. I am not a professional. Everything I do is through a process of trial and error. With each post, you learn what doesn't work and what does work. You try to improve with each week and sometimes it work and sometimes it doesn't, but as a blogger, I am always trying to get better. Trust me, go back and view some of my older posts. Those were crap. LOL. So, after licking my wounds and emotionally cutting by reading the replies over and over, I decided that for my own sense of pride, I would re-swatch Charlotte. I thought the color was awesome, but most of the replies centered about just how bad my swatches were of that particular color. So, I dug out my old camera (seriously, this Canon and I are not getting along) and took some new pics. ﻿This is 2 coats of Julep Charlotte. I used my older Sony DSC-W310 with a filtered flash under a desk lamp. I also cut down my nails as I just don't think longer nails and I get along. If you had an issue with my previous photos, I really hope this shows Charlotte in a different light. It's a beautiful color. 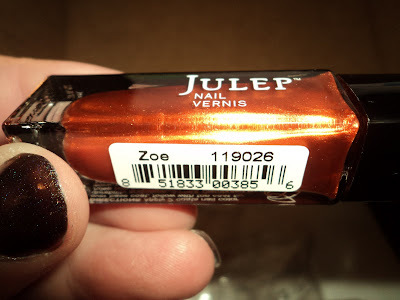 So last week, right after I showed you my review for Julep polishes, I caved and joined the Julep Maven program. I thought it was a great deal at $19.99, and also, as nail mail is one of my guilty pleasures, I figured it was a good way to get a box of nail goodies every month. Samantha - bright pink. This one is amazing. It has a jelly-ish finish, but it was opaque in 2 coats. Zoe - bright copper. Seriously. This is like the color of new pennies. This is one of their not-yet-released fall colors. 3 coats. This is the "Bombshell" box. Honestly, I had to do a little manipulation to get this box. I took the "style quiz" at least twice, and it each time it came back as "All American Beauty". Well, while that may fit my fashion sense, it's not exactly what I prefer on my nails. So, I chose the strappy shoes instead of the platforms, Chanel as my designer, rather than J.Crew, and picked Colin Farrell over George Clooney (what?) and voila... I'm a Bombshell. Also, keep in mind that Julep has a few coupon codes for the Maven program floating around. I think there is one on Facebook, and also, when I took the quiz, I got a code in my email box to for 1/2 off my first month. Unfortunately, I had already joined by that point, and I'm still trying to see if I can get that retroactively applied. So be sure to check for those codes before joining. Even with paying full price, I still think this is a great deal. I know Julep polishes get a bit of a bad rap for being such a small amount (.27 oz, compared to .5 for OPI), but as I have NEVER used a full bottle of polish, I think I'm good. LOL. Plus, there are other goodies, and 20% off all other items that you order (I am eyeing Stella) and free shipping (which when I get free shipping, I feel like I've won the lottery, so that's awesome!). 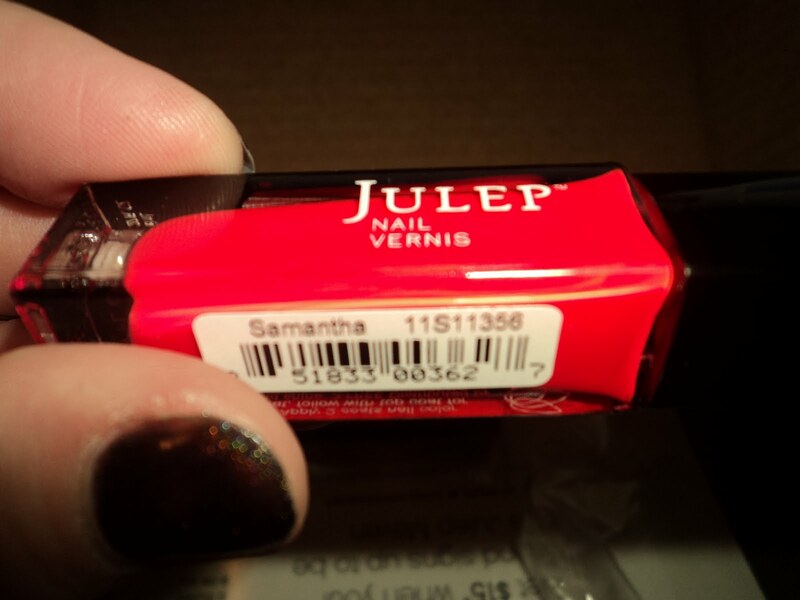 And, if you refer your friends to Julep, you will get $15 when they become a Maven as well. You can join the Julep Maven program on their website, or by clicking here. I paid for my own membership to the Maven program. However, the links within this post are affiliate links. I will receive $15 when you join by using my link. When you join, you will get your own link. Due to some recent nail growth, I am trying to keep my nails polished, which means that I am polishing my nails everyday (I have the attention span of a gnat). I've been mainly sticking to new releases, as that's what I've had on my desk, but tonight, I brought this one out of the depths of my storage container, and oh how happy it's made me. This one is absolutely amazing. It's varying shades of gold glitter with pops of bright, purple glitter, and as yellow and purple are opposites on the color wheel, the color combo is gorgeous. The base is clear, and though it looks like there are bald/thin spots in my swatch, the coverage on the nail is actually quite good. Any thin spots that are on there, don't show up to the naked eye. 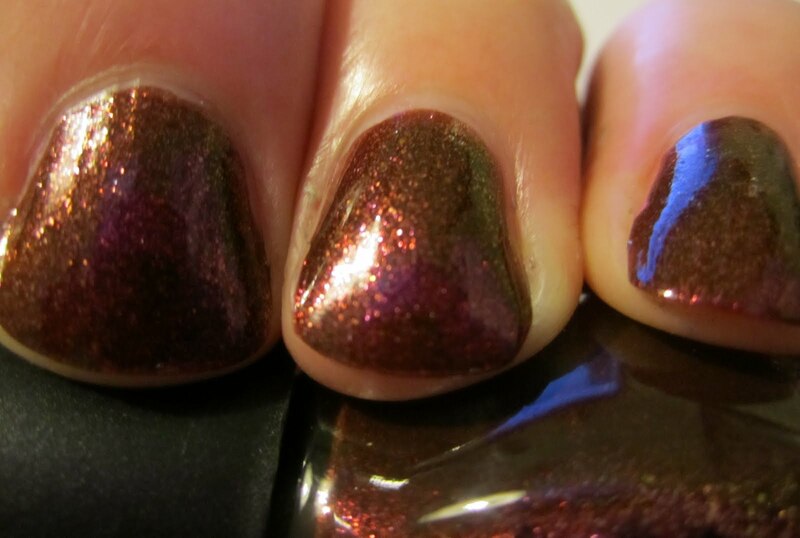 This is 3 coats of Look Rich Be Cheap over a coat of CND Stickey. I also had to apply 3 (!) coats of TC as it still seemed really textured at just 1, or even 2, coats. Honestly, even with the 3 coats of TC, it's still not smooth, but that's pretty much par for the course with a dense glitter. 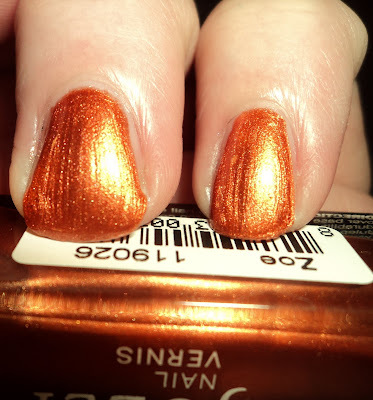 Also, I realize I have reviewed Look Rich, Be Cheap already in the past, but as that way back when my nails were recovering nubs and my camera was crap (and perhaps a lot of user error), I figured I'd give this one another showing. 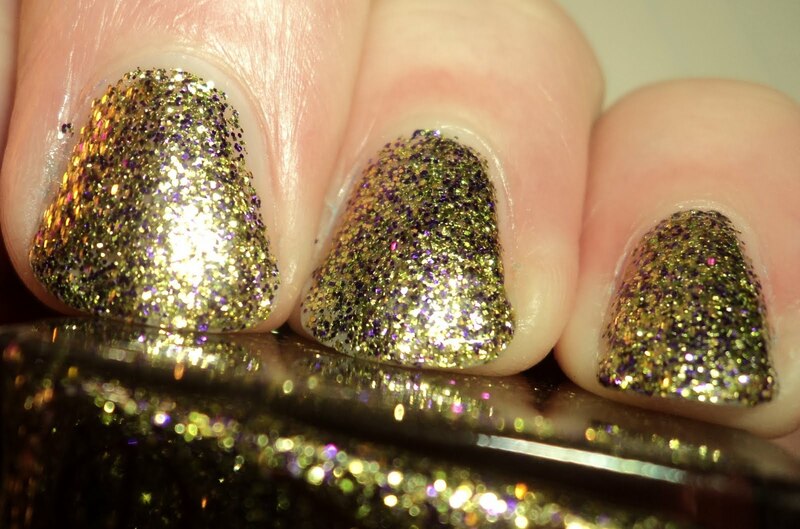 Look Rich, Be Cheap is the only glitter bomb still remaining in stock on RBL's website (though I think Locavore is coming back). Price is $18. You may remember that around the first of the year, Ji offered a RBL fan submission contest. My entry was for an "oilslick" polish. Unfortunately, it wasn't selected (it may have been put in her "impossible" catagory. LOL), so I was more than a little excited with Sarah's Seashell/Oilslick inspiration polish was voted to be in Lex's line up of polishes. I finally got around to getting this one last week, and while it's a very pretty polish, I have to say, that I'm a tad underwhelmed. :( This is a deep charcoal base with tons of subtly holo microshimmer. Again, it's pretty, but it doesn't quite meet what I had in mind. I expected it to be a duo/multi-chrome rather than a holo, and the black base really took me out of the "inspired by a seashell" backstory. It's silly, but in my mind, there is a bit of a disconnect between a deep charcoal polish and a seashell (of course, I fully admit that is probably nitpicking). Also, when you have a polish like this, it comes with the territory that it's going to be compared to OPI My Private Jet holo. And when you do that comparison, there is no contest. My Private Jet will always reign supreme (of course, it's now super rare and $$$, so perhaps this would be a good lemming slayer) However, Seashell seems very similar to Color Club Revvvolution (which I blog-sold or I would compare) and perhaps Diamond Cosmetics Chainmail Charm (which I never owned). Even with my issue regarding the color and leakage, I still wouldn't dissuade you from picking this one up, especially if you don't have any of the similar colors, and one of the reasons I'm saying this is because of the company, Lex Cosmetics. First off, this is the only company, that I can think of, that let's their customers decide on their entire color line, not just a couple here and there. Also, $1 of each bottle sold goes to the charity of the creator's choice. In this case, Sarah's requested that $1 go to the fight against sexual assault. Seashell is available at www.lexcosmetics.com, and the cost is $10 per bottle. I shouldn't love this one as much as I do. It gives me red-hands, and it's not a particular pretty color, but that doesn't stop me from being madly in love with it. I can't really tell you why. It's an odd, slightly dirty, artichokey green creme. However, the formula is fantastic and the application was flawless. Plus, I like that the color is a bit of an odd duck. It's not typically "me", but I do like it. LOTS. 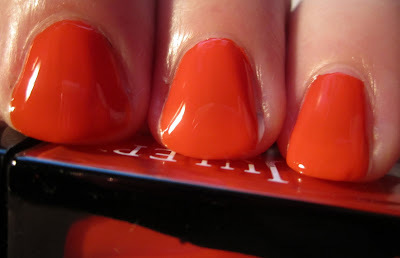 Stranger Tides is from OPI's Pirates of the Caribbean collection that was released earlier this year. 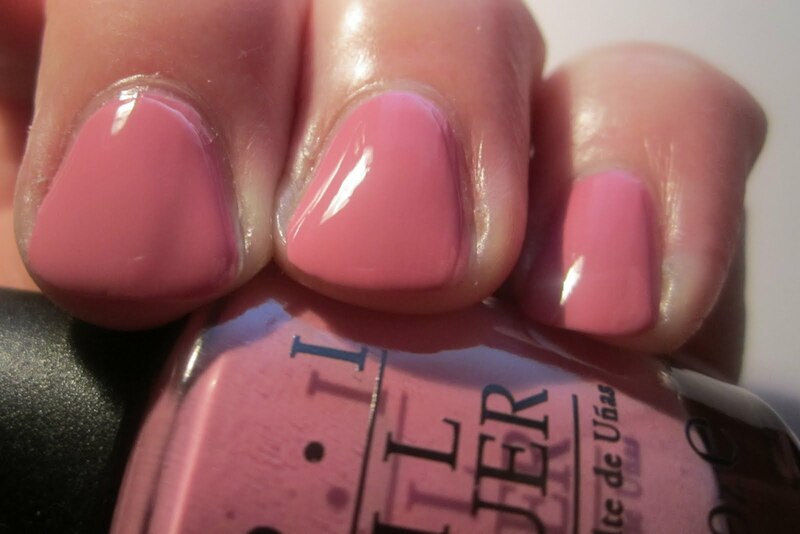 This has been out for several months and OPI's polishes retail for around $8.50. When I posted my review of this collection yesterday, I was very unsatisfied with my pictures. 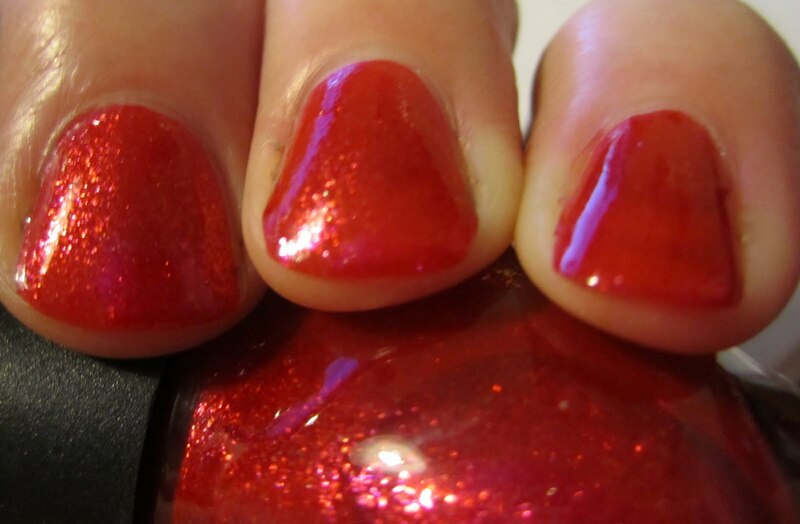 However, as soon as I finished my review, I put I Love You Cherry Much on my nails as a full mani, so I wanted to share that picture, as I feel it's MUCH better. After I've gotten a chance to wear this color as a full mani, I must say that I really love it. It's also completely unique. Yes, it's a glass fleck shimmer (a la China Glaze Summer Days) and yes, it also has a metallic element (like the shimmers from OPI Burlesque), but the finish on this is what truly sets it apart. It was hard to capture with the camera, but this one dries to an almost-satin finish. That allows the shimmer to become "trapped" (like it is when you put a matte top coat over a shimmer or a glitter), and gives the shimmer much more depth. Again, that's one of those things that just couldn't be captured with a digicam. If you like bright, pink-based reds, I would totall give this one a look-see, as it is gorgeous! 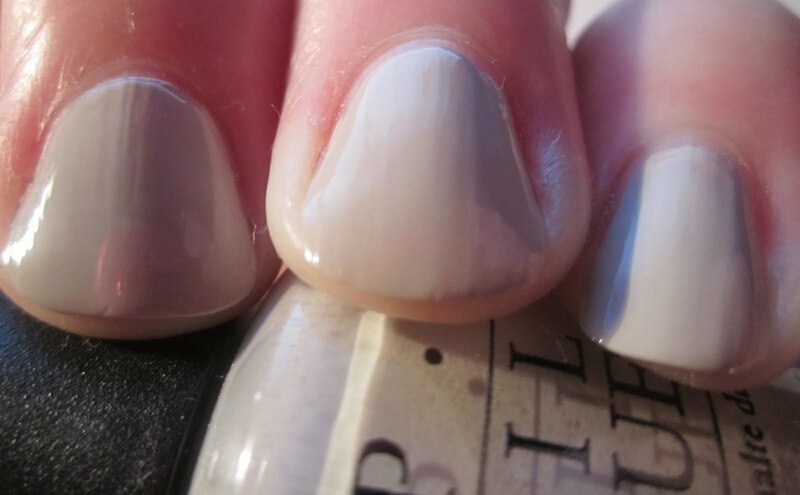 Also, in my swatch yesterday, I used 3 coats, and in my full mani, I only used 2. I do have a bit more VNLs in this one, but they aren't that noticeable. Like I mentioned yesterday, these are available at Target now (or at least they are at mine). And, like most of the other Target-exclusive NOPIs, I am assuming this will also be available at Target.com (though I don't see it now). Retail is $7.04. Back in March, I showed you the Nicole by OPI Spring Target exclusives. Well, they have come out with 4 additions to this collection for Fall 2011. FYI, I got a new camera, a Canon SD1400IS, and I am still trying to work out some growing pains, so I'm sorry if these pictures are sub-par. Green Up Your Act - dusty, greyed olive creme. I struggled with this one. I swear, I swatched it twice and took a gazillion pictures and I still wasn't satisfied. The color is definitely unique. It's not a traditional camo green, or an olive green for that matter, it seemed to have a lot of blue/grey in the base. It also had a dustiness to it. I struggled with the formula, as it seemed a bit goopy to me. Picture is 3 coats, and I had an issue with drag, so it looks lumpy in places. It's Not Me, It's Blue - Grey/blue metallic shimmer base with purple microshimmer. This one is amazing. I saw it at my local Target, and I immediately fell in love. I promply came home and put it on my nails. 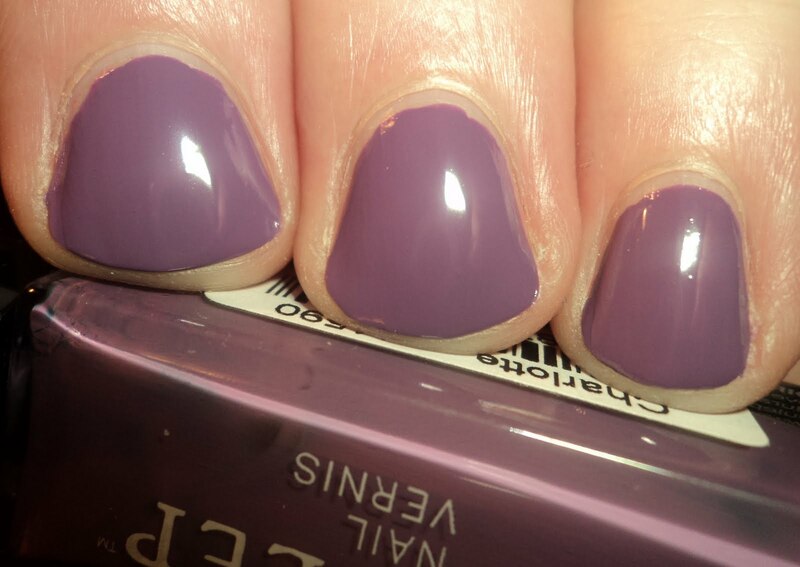 It's very similar to Sounds Grape to Me, it terms of formula and finish, and it feels almost like a foil. It also has a beautiful purple shimmer that will pop when you turn your hand (there is also some golden shimmer, as well). The formula was thin, so I did have to use 3 coats, but they dried quickly, so no issues. Also, this picture was taken with my old camera, so that's why it seems a bit different. Sounds Grape to Me - Deep purple/burgundy shimmer base with golden shimmer particles. 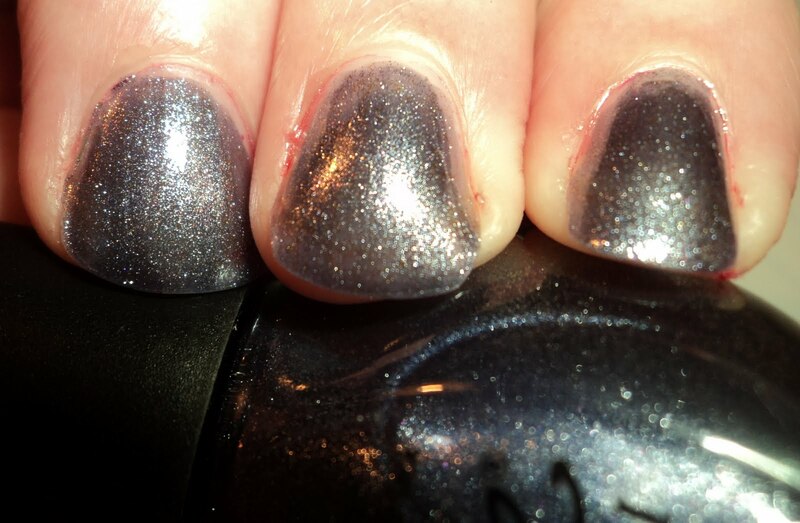 This one was very reminiscent of OPI Tease-y Does It or Zoya Valerie, but unlike Tease-y Does It, this one didn't seem muddy. I think this one is my favorite of the 4. The color is practically mesmerizing. Formula was good and it reached opacity at 2 coats. 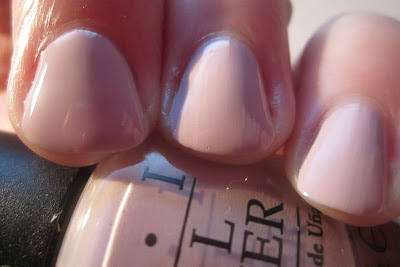 All in all, I like this little addition to Nicole by OPI's Target collection. Green Up Your Act does seem to be the odd duck, but those of you that like dusty, ugly-pretty colors, will love it. Also, and this may just be because my were press samples, but only Green Up Your Act had Nicole's new brush, and that's perfectly fine with me. However, if you are a fan of their new brush, be sure to check your bottles at Target to see if they have them. These are at Target now and retail for around $7 each.